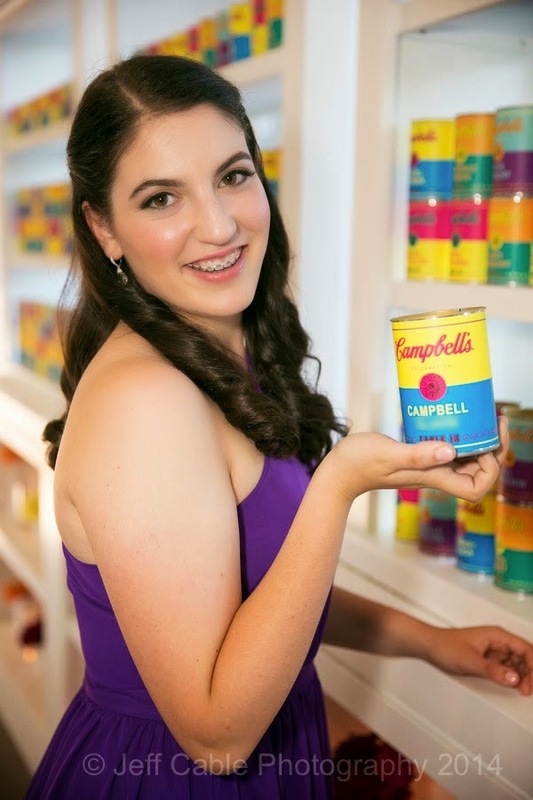 Jeff Cable's Blog: Photographing a Bat Mitzvah - The fun, the challenges, the emotions and the results! Photographing a Bat Mitzvah - The fun, the challenges, the emotions and the results! Last Saturday, I posted a couple of photos on Facebook, from the Bat Mitzvah I was photographing. Numerous people contacted me and asked how I photographed the event and how I overcame certain challenges. So...I decided to write this blog to walk you through my day and tell you my thought processes and camera settings from morning to night. The photography commenced at 8:45am, with just myself and Campbell. I like having some time with just the two of us capturing some photos. Normally this is a great time to gain their trust and get them warmed up in front of the camera. In this case, Campbell and her mom had already spend hours with me the month before, shooting portraits that would be used in the party venue (which you will see in a little bit). When we did the portraits in July, I was struck by how mature this 12 year old was. She just radiated with self confidence and poise, so I knew that the mitzvah day was going to be a blast. I was really happy to arrive at their Temple with overcast skies above. A giant softbox in the sky - awesome! I liked the repeating lines of the brick wall and used those with Campbell in the foreground. I shot this with the Canon 1DX and the 70-200mm lens at f/3.5. I usually try to get a photo of just mom and dad. Even though their child is the star of the day, I find that many couples do not have any recent photos of just the two of them. Campbell's grandfather showed up with this great hat. Some of the kids were playing with it, when I saw the opportunity to grab some really fun shots. I had little Jasper stand by the wall and asked him to cross his arms. He did that and then gave me this look. Oh my goodness - it was hard to shoot this while cracking up! What I love so much, is that you can totally see Jasper's personality in this photo. After shooting the portraits outside, we moved inside the Temple to shoot photos in the synagogue. And once again, we kept it light, fun so that I could capture Campbell's personality. What a great smile! My buddy, Andy who own Blue Moon Productions, was shooting video for the family, so I put the Sigma 85mm 1.4 lens on the 1DX and shot this for him. When I am photographing a mitzvah or wedding, I am looking for those unscripted moments which show the emotions of the day. This is one of those moments when Campbell and her mom shared something funny between themselves. I shoot most everything from the camera mounted on the tripod, except when the Torah is carried down the aisle. For this, I have a Canon 70-200mm 2.8 IS lens on the second camera body (handheld) and move into position. I change the settings of the camera to a high ISO (in this case ISO 3200) to achieve a fast enough shutter speed to freeze the action. I also set the camera to servo focus, with the focus point up on the face, to track the child moving towards me. Once the service and luncheon were over, it was time for me to head over the Golden Gate Bridge to their party location. It was 2:30pm and the party did not start until 6pm, so I figured that I had a little bit of time to shoot some photos from the Marin Headlands. I figured that this could be a good background for their album, and I did something similar for them at a previous event for this family. I grabbed this shot and a couple of others and then headed to the party venue. Even though it was 3 hours before the start of the party, I knew that I had a lot to do. I went through all of the photos from the first half of the day, and built a slide show of the best 200 images. I also photographed all the detail shots of the venue (and there were a ton of them). Then the family arrived and it was time to take more portraits of Campbell. The coordinators did an amazing job at this event, making all these cans, which were the place cards for where everyone was sitting. Since there was a window right by this display, I asked Campbell to turn towards the window and shot this image. It is hard to believe that she is only 12 years old (about to turn 13). Remember, at the beginning of this blog, how I mentioned that we did a photo session at my house? Well...these are some of the photos that I took. Campbell and her mom knew exactly what they wanted. They wanted black and white images and they wanted them to be high contrast and grainy. I shot many different photos of Campbell and then processed them in Adobe Photoshop and NIK SilverEfex Pro, to get this look. for this photos, I position the family members along the wall of displays. The challenge was, the displays were so bright that the camera metered the family members so that they were dark. Even though I was using a flash on camera to fill-flash them, I had to go into Photoshop and use the adjustment brush to brighten each of their bodies. This one photo took me 30 minutes to retouch. I love having fun with the family. It makes the whole experience better for them and me! The party was located at the Design Center in San Francisco, which is a really cool building. There are many floors to the building which surround this large open foyer, with a glass ceiling above. This posed a photographic challenge, since there was no ceiling for which to bounce light from my flash. But it also meant that I could set up a remote flash (using the Canon 600EX-RT flash) on the second floor balcony and aim it down at the dance floor. This was the first time that I had a remote flash that high above my party, and it worked really well. Before I ran up to the 3rd floor balcony, I asked Adam Goldstein, (the DJ) to have all the people wave to me after they were done dancing. I had my Canon 1DX and 16-35mm wide lens for this shot. At one point during the party, Campbell gave a speech. I stood in front of her and took some close-up shots with the 70-200, but wanted something different. Anyone who has watched me shoot, knows that I am very "Type A" and like to move around a lot. I quickly moved to the other side of the room, and shot this photo of Campbell speaking (side lit by my remote flash on the second floor) in front of all her quests. Here is a photo of mom and dad on the dance floor. I took numerous shots during this dance, but this photo stood out, with them looking at each other showing complete happiness and love in their smiles. Another really nice moment with Campbell and her dad. I usually do a group shot of all the kids when I photograph a mitzvah, and this time was no different. What makes this photo different is that I did not use any flash. I relied on the small video light from Andy's camera to center light Campbell and the girls in the middle, and let all the others gradually fall into a slightly darker exposure. Another fun moment to capture...with this little guy up on the shoulder of one of the DJs. Adam having some fun with Campbell's little sister. As soon as I saw the DJs break out the glow sticks, I went back up on the 3rd floor balcony to get some wide shots of the dancing. I tried shooting this with the on camera flash and remote flash, but the light from the flash would overpower the glow sticks. So, after some experimenting, I turned down the flash power (by 2 stops) to both flash units (which I can control from the 600EX-RT flash on the camera) and grabbed this shot. After shooting the shot from above, I ran back down just in time to get all the kids throwing their glow sticks in the air. This last shot was a request from Campbell. She had seen one of my photos from another mitzvah, where I was on the ground and shooting up at the kids. She asked for this shot, so I had her get all her friends together for this photo. This is taken with the Canon 16-35mm lens and a diffused flash on camera. I put the focus point on one of the kid's face, hold the button half way down, and then reposition the camera to get them centered, and then shoot. After it was all said and done, I took 3700 photos, changed camera settings hundreds of times, walked more than 9 miles, burned 5000 calories (according to my Fitbit). and enjoyed every second of it! Jeff - I really like your informative and fun-to-read style. Many thanks for taking the time to spell it all out. Just wanted to let you know the B&H link goes to the B&H site, but give me the message "The page you requested has moved or is no longer available. Showing results for "Items".